Although there are Fed & State minimum requirements for safety equipment that must be kept on board your boat or PWC, being legal doesn't always mean having everything you may need. Required items are easy enough to determine. Just ask for a free copy of the ODNR and/or Federal Regulations booklets we keep on hand for our customers. VHF (ship-to-shore) radios are not required by law, but you wouldn't catch me on Lake Erie or any other large body of water without one. Not having phone numbers for local Marine Patrols, the ODNR, Coast Guard, or especially a boat nearby that could be of service, can cause delays that could be disastrous. Cell phones may or may not get a signal. If you don't know your exact location, your position can be determined from a VHF transmission. 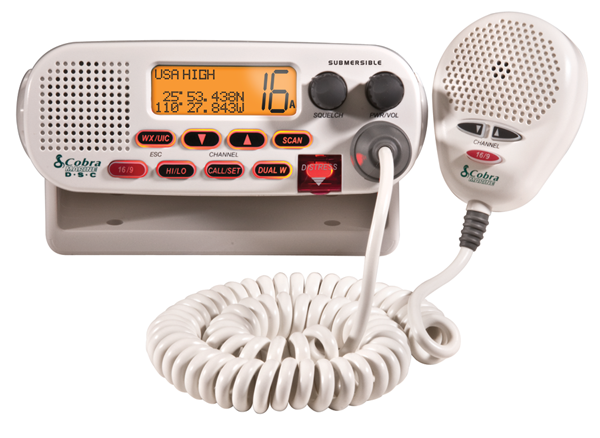 Newer VHF's have DSC (digital selective calling) to send out a distress call (it's like a 911 system for boats). Also, check into connecting your VHF and GPS/chartplotter system so the DSC sends out your coordinates, not just a distress. But most importantly, making a distress call on a VHF can get you quick help by anyone nearby who may be of assistance. 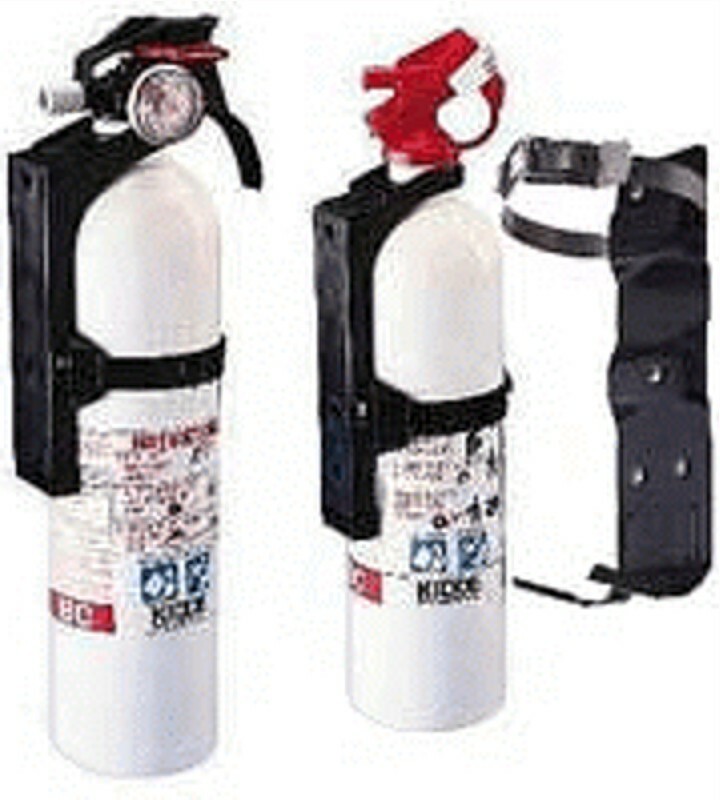 Probably the most common things people think of for safety equipment are items like fire extinguishers and flares. Type B:C extinguishers fight flammable liquid and electrical fires. Type A:B:C extinguishers fight common combustible material fires as well. There are several different styles of flares, each serving a very useful purpose. Just because the minimum requirement is (3) doesn't mean that's all you should have, especially on large bodies of water. Most people think they're too expensive and a waste of money. But if you've lost electrical power or your VHF isn't working, you'll be glad you have flares. Hand-helds are less expensive than 12-gauge guns. But if you're not close enough to another vessel or to land, hand-helds won't help you because no one will see them. So you decide to spend a little more and carry 12-gauge meteors instead... Now you can attract attention farther away, but once a prospective rescue vessel locates the general area where help is needed, they still need to know the flare's point of origin. Without the hand-held flares, the rescuers don't know your boat's specific location. The 12-gauge meteors will alert someone to the general direction of the flare's origin, and the hand-helds will help them pinpoint where the 12-gauge flares originated. Thus, the terms "alert," "locate," and "alert/locate kit" on Orion flare packages. Standard red flares can go unnoticed in bright sunlight. That's where the day-smoke flares, mirrors, distress flags, horns, whistles, and other signal devices come into play. Your type of vessel, and how, when, and where you use it, should determine the best combination for your needs, not the minimum requirements. If you're ever in a position to need safety devices, you'll think twice about whether "minimum legal" is good enough. Check your fire extinguisher(s) and the expiration dates on all your flares regularly. They may still work perfectly fine, but you can get a ticket for not having current fire extinguishers or flares. And don't keep too many expired flares on board. It becomes a safety hazard. Don't set off live flares to practice. Use a white practice flare. And don't set off flares to discard them. A false distress signal is a felony offense, punishable by time in prison, plus a fine, and the cost of the rescue attempt. A watertight case, compass, GPS, electrical tape, boat hook, first aid kid, and spare prop are not required either, but all are good to have. Boat hooks are useful for retrieving items from the water, and for pushing off of a dock or away from another vessel. (Don't try moving a freighter out of your way, but if a small pleasure boat is about to bump into you, or you're about to bump into a dock, it'll help.) You can also use a boat hook as an extension for your hand-held flares by wrapping the flare to the end with electrical tape. It gets the flare up higher and also keeps it away from your boat. Minimum requirements are just that. Common sense should help determine what other items you should have on board for truly safe boating.